Many people like the idea of buying a new car for various, often trivial, reasons. They may like the idea that nobody has possibly abused their car in the past, think it is the only way to have a full warranty, or maybe they just like saying they bought a new car. Regardless of their reasons, when it comes down to reality, these people are wasting thousands, sometimes even tens of thousands, of dollars that they could use elsewhere. This is especially true in the area of premium, high-end cars. This wasted money is partially in the list price markup that many of the more esteemed car makers add to their cars just because they can.This price markup is lost in the value of the car quickly, well within the period most people will keep a car, so it will all be pure loss if the car was bought brand new. Price markup is only one part of the wasted money though. The real killer lies in the options list for most high-end manufacturers. In some cases you can actually double the price of a car just by adding options, money spent that will only add very little to the value of the car once it is on the secondhand market. For example, if you go on Porsche’s website and build a 911 Carrera, you can load up the options list so it will cost more than a GT3, but once you drive it off the lot it becomes just another Carrera with some miles on it. Almost none of the extra money spent will hold any value. That would make around $120k spent on a car that would be worth $75k or so once the title has been signed, a total loss of $45k (the price of many other very nice cars), and for what? 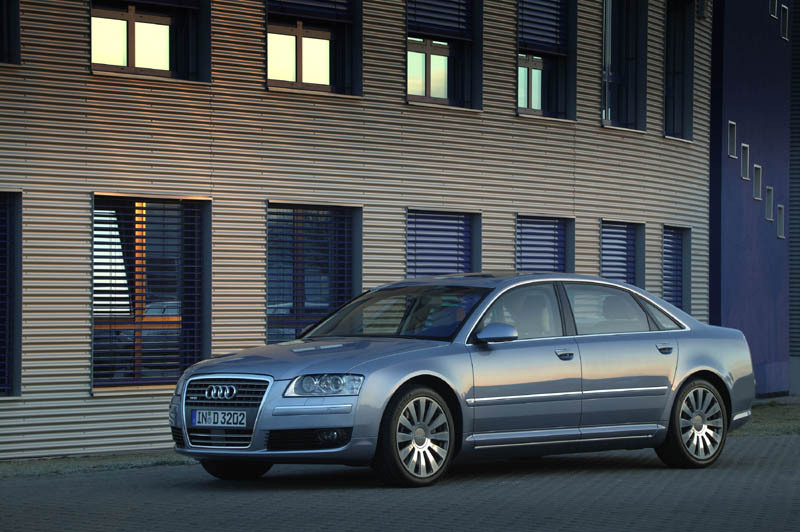 Audi A8 from 2005, same type I drove at work. Full size, German luxury cruiser and it was the price of a new Honda Accord. In my opinion, it is foolish to spend all this extra money on a car you can buy for nearly half the price in a few years time. Plus, most cars have a rather large model life, meaning that the newer versions won’t change much from year to year. I realized this when I was working at a dealer a few years back; I drove a 2005 Audi A8 that we had listed at $27k and I realized it was basically the same as a brand new 2008 model that cost around 3 times as much. Same car, same image, same luxury, less money; just a few miles on the clock but nothing insane, I remember it was in the 30,000s, Toyota Camry money for a very impressive automobile. An early 2000s Merc CL600 just like the one Clarkson bought for the same price as the cheapest new car in Britian. A bit of a step up, I’d say. This past week on BBC Top Gear, they showed exactly my point here with their piece on buying the best secondhand cars they could for the price of the cheapest new car on sale in Britain. They both wound up with V12 GT cars, a BMW 850Ci and a Mercedes CL600, that make any car person wonder why anyone would buy a cheap, bare-bones, new car when such quality and status can be had for the same money. This is all of course completely ignoring running costs though, however their point was well made. I am to the point now where I see very little value at all in the new car market, especially in the high end. The number of cars I would actually ever consider buying new in this market I could probably count on my fingers (the Cadillac CTS-V being one). Why would I want a new BMW 528i when I could have a used E60 M5? I guess as a car guy, I see the market as such, but even if you’re not into cars you can save a lot of money by buying the same car that you want new on the used market from a few years back. Many folks are nervous about buying used cars, but if you do it properly there is little to fear. First off, most of the luxury cars on the used market after only 3 years or so probably have come off of a lease, which tells you it was properly maintained. Also, buyers of new premium cars tend to have money and likely will not have cut corners in maintaining their car. Most just send it to the dealer anyway and just pay the bill, so maintenance shouldn’t be an issue. You should, however, ALWAYS have any used car inspected by a 3rd party mechanic just to ensure it is in proper condition. If the dealer will not let you, simply walk away from the deal, because they are surely hiding something about the car. Lastly, most rather recent cars will still have their warranty on them and warranties can be extended if you wish to shell out some money, a worthy investment with most high-end cars in my opinion, because maintenance is very costly. In some cases the older cars are actually better than the newer cars. This Mazda RX7 puts the newer RX8, which replaced it, to a huge amount of shame. When it comes to buying cars, I advise a general rule; if you can afford something without stretching yourself at all, then by all means go for it. However, if you must strain your finances, even a little, to get the car you desire then I say buy, buy it used. You will always find better cars on the used market at a realistic given price range than you will find new. It is a way for everyone to save some money. Whether you like cars or are just in need of transportation, buying used is the smartest way to go unless you really can afford to waste your money on all those little options and markups. I’m not sure I can say that I agree with you 100% but perhaps I need time to let it sink in a little bit. I appreciate that you’ve given me somthing to think about on a larger scale. Seriously? I’m not so sure I can agree.